Toma tantas bebidas del bar abierto a bordo. Disfrute del atento servicio de la tripulación. Visite las tiendas en Isla Mujeres y compre artesanías y recuerdos únicos. Comida buffet y equipo de snorkel incluido. En Cancún le espera un espectacular día de navegación. Por la mañana, diríjase a Playa Tortugas y suba a bordo del barco. 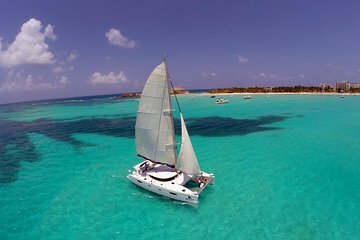 Una vez a bordo, vea cómo cambia el color del agua de azul oscuro a turquesa mientras navega por las aguas cristalinas de la bahía entre Cancún e Isla Mujeres. Sienta la bruma marina y el cálido sol mientras saborea refrescantes bebidas de la barra libre. Haga una parada en uno de los principales lugares de esnórquel y submarinismo, en uno de los arrecifes más grandes del mundo, y entre al agua para nadar junto a las formaciones de coral y los peces de colores. A continuación, atraque en Isla Mujeres y acomódese en un club de playa para disfrutar de un delicioso almuerzo bufé. Baje la comida con una tranquila exploración por la tiendas de artesanía de la ciudad, donde podrá encontrar desde recuerdos a joyas de oro y plata. Realice el viaje de regreso al puerto deportivo de Cancún. Si el tiempo lo permite, termine el día por todo lo alto con un paseo en el spinnaker. We had a very good time. It’s a long day but a good price for a gorgeous boat ride, a little snorkeling and a nice buffet. There is also a swimming pool near the buffet that is free to use and you can swim with dolphins for an added cost. No spinnaker rides while we were there. This was the best way to discover Cancúns islands. We had been staying in Cancun for a couple days and had enjoyed the ocean from our hotel beach. I was blown away with the view from our room, but did know it could be so much more. We arrived at the dock at 9:30. We were then offered an upgraded package, which I would highly recommend, it offered a smaller boat and more private experience. Once we boarded around 10:15, I quickly realized how beautiful the Gulf of Mexico is. I can not stress enough how beautiful and clear it was. The crew was very attentive and helpful. Lunch took place on an area dedicated to their tours. After lunch I feel asleep in a hammock while my husband enjoyed the ocean, so relaxing. Next we sailed around the island and got dropped off at an area where you could purchase souvenirs or swim. Lastly the dropped the anchor and we did a sail swingfor strong swimmers. This was the highlight of my 5 days in Cancun! The guides were so great and fun to be around. It was smooth sailing and such a great time. Make sure to bring cash pesos to tip and purchase photos if you're interested! I didn't realize so I used the ATM at the pier. Lunch was delicious and I especially enjoyed relaxing in the hammocks afterwards! OMG!! This was so much fun!! I would recommend this company to every person that visits! The boat was spacious and the crew was excellent. They were very nice and did a great job of communicating with everyone. The food for lunch was great! I wouldn’t change a thing about this trip. If you only do one thing in Cancun when your on vacation! This is a must do and with this tour group.. the boat wasn't over packed the staff were amazing!! They are safety conscience at all times, but let you have fun. This was my wife's first time snorkeling and she was a little scared. She freaked when she got in the water and the guide had her hold onto the ring and she was fine. She had a great time and the staff saved the day. We got to eat traditional Mexican food on the Island and it was really good. The beach at the restaurant is beautiful. After lunch you can go grab a hammock with a cool beverage. The entire time beverages are being served, so you will not get thirsty. Water, Beer and mixed drinks. Bring your bio-degradable sun block for this trip as its expensive on the dock. Isla Muhares is beautiful! Make sure you see the other side of the island, there are incredible beaches and views. We rented a golf cart for 1 hour for 60.00, it was close and we made it but I wouldn't recommend it. We didn't stop but once..if your late you get charged another hour. The trip back to Cancun was a ton of fun, I got to do the spinnaker ride which was a blast. I hung on for a good 5 minutes. I didn't mind tipping these guys well. They work hard and did a awesome job, I have not laughed like that in a very long time. This trip was Great! The whole crew was very friendly especially Jose. He gave us his own little trip guide on places we could go visit. 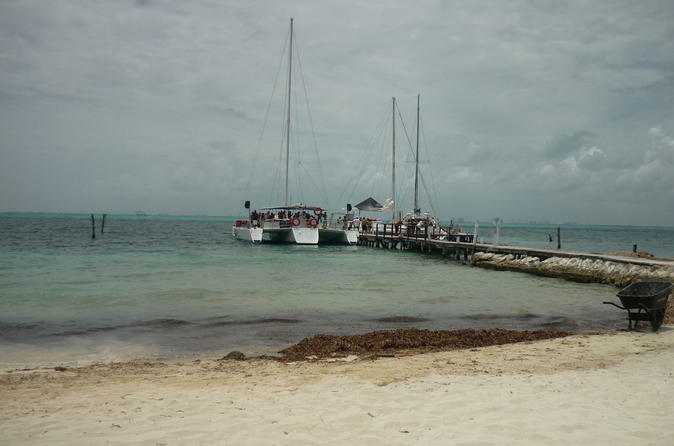 This excursion was one of the best with a water activity, open bar, snorkeling and they take pictures (you have to pay), buffet lunch on another island. Loved it! The people were great, the food on the other side of isla was good, the chicken great, the fish awesome. I am not a drinker, but they supplied plenty of water and drinks were always passed around. the crew was good and on time coming and going. Honestly get there at 9 30 am and you will be fine, we got there at 8:30 and our boat left at 10:15. We were the first in line in tickets, the boats go out by 5 colors only about 20 people per boat. No dancing like the bigger boat, you literally sit on top of the boat. Yes no chairs or seats. sit on the boat, front or middle. The sailing at the end was for experts only, yes swimmers with many years under their belts. Never did this. The snorkeling was OK, not a lot of fish they said, I stayed on the boat and seen a ton by the sides. Next time I will taker a bigger boat to compare. This tour was fantastic! We had to find our own way to the dock, but once we got there it was a great trip. The staff were great! Always smiling and very polite to the clients making sure we all had a great time which we did!. The sailing on the ocean was so beautiful, peaceful and colorful... we stopped to do the spinniker sp and that was quiet something to see, my brother loved it. We sailed on and stopped to snorkel for a bit... the guide was very informed and made sure he knew where everyone was, then we sailed out for lunch which was very good. After that we sailed around the Island and pulled into the town where we had free time to explore.... will def. have to go back one day and spend more time there. My brother told me that there is an Ice Bar which is made of ice and not many people last long in it lol. Then back on the water sailing back to Cancun... it was a very long and tiring day.. but oh so worth it! The memories will always be with us. Thanks for a fantastic trip! It was a beautiful day in Cancun so at first we got lucky ! The crew was great and very entertaining, the scenery was wonderful ! The buffet lunch was really good and all the activities were fun! Snorkeling wasn't very long but enough to see some fish and corals. I'm glad we took that trip, it was worth the money and really fun!